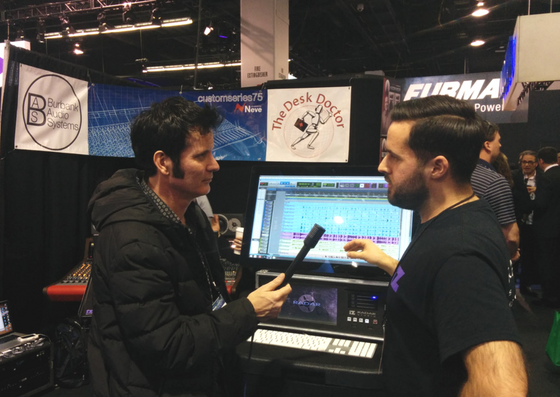 We sent Rob, our Session Software guru, down to the NAMM show to demo our brand new software, Session. Turns out it was his first ever NAMM show! We asked him to share some of his thoughts and experiences. We’re back from the 2017 NAMM show and what a great show it was! We were very happy hanging with old and new friends from Pro Audio Design and pleased to be featured next to great gear like AMS Neve consoles, Augspurger monitors and Sontronix microphones. Thanks to everyone who came and visited us! We were pumped to show RADAR Studio, as well as our new products Session, Remote and Touch. This was my first NAMM show experience – and in fact my first time in California too! Having heard so much about NAMM over the years, I expected this was going to be awesome. Unexpectedly, the record breaking flood of rain (I was told, the most ever in Orange County history! ), standing in inches of water at the food trucks, and clearing out of the convention centre as sheets of rain came down made this NAMM extra memorable for all. We were excited to demostrate Session (coming to our website soon! ), our newly announced DAW, and its controllers Remote and Touch. Pro Tools Expert’s James Ivey came by to share his excitement for Session, as well as the RADAR Studio he’s been using in his own studio. Produce Like A Pro’s Warren Huart stopped by to shoot a demo video for our multi-touch controller Touch and Remote. Oh, and I can’t forget about getting to rub shoulders with Stevie Wonder. The legend is a long time RADAR fan and honored us with a visit! To all the people who came by our NAMM show booth – THANK YOU! It’s gratifying to hear about your studios, your work and your art and hear how RADAR and iZ Technology is providing for you. Your anticipation of Session was awesome. Your excitement about iZ bringing multi-touch mixing and control to Session and Pro Tools was thrilling. The look on your face when you saw Remote appear on your smart phone was incredible! And lastly, so many of you came to us praising the sound of RADAR and the iZ AD/DA converters. This whole company is built on that sound, and we’re committed to bringing you great sounding products that are easy, simple and powerful solutions for your production needs. To those who couldn’t make it out – we missed you! We look forward to connecting soon. See you at the next NAMM!